Gareth Bale celebrates a goal. CRISTIANO RONALDO’S DEPARTURE will be judged on bigger games than this but Karim Benzema and Gareth Bale continue to provide the smoothest of transitions after each scored in a 4-1 thumping of Leganes on Saturday. 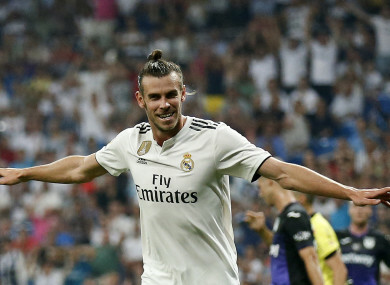 Bale had earlier broken the deadlock with a smart half-volley, which was briefly cancelled out by Leganes’ Guido Carrillo, who converted his own spot-kick to ensure Thibaut Courtois’ first Madrid contribution was to pick the ball out of his own net. Email “Gareth Bale on target as Real Madrid continue winning La Liga start”. Feedback on “Gareth Bale on target as Real Madrid continue winning La Liga start”.